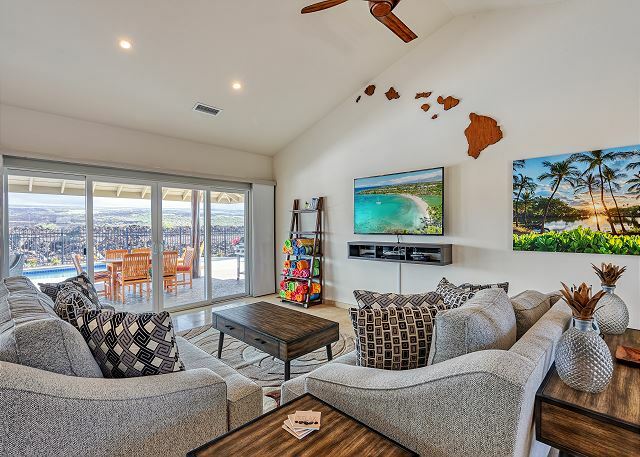 This beautiful 3 bedroom home at Ainamalu at Waikoloa Beach Resort is situated on a large lot offering plenty of space for families and offers an amazing open view with Mauna Kea as the backdrop! 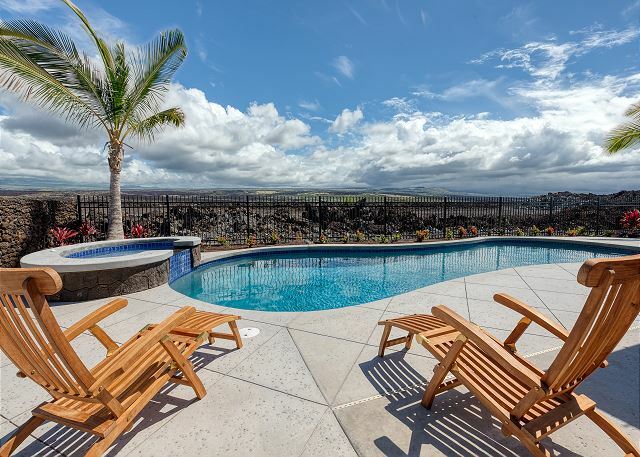 Enjoy a 3 bedroom home in Waikoloa Beach Resort at a nice price. 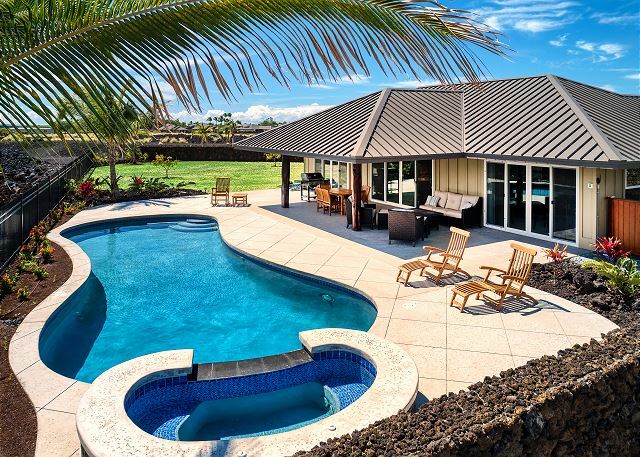 This home is situated on one of the larger lots at Ainamalu and offers an open view with both the Mauna Kea and Mauna Loa mountains in the background. The spacious great room offers ample space for families. The living room has two sofas facing a wall mounted big screen LCD television with extended cable and a DVD player. Adjacent is the kitchen and dining area. The dining area seats 6. 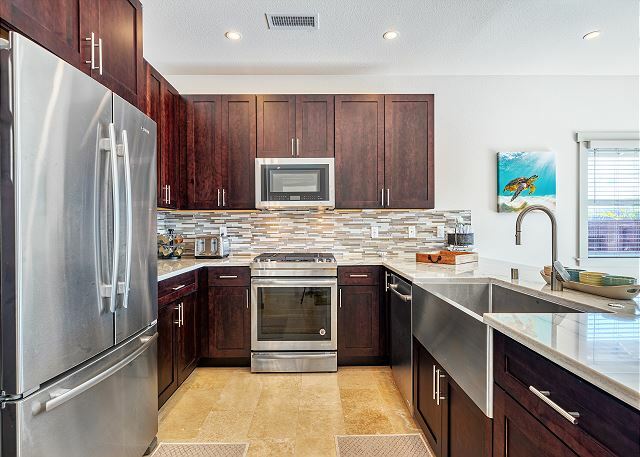 The kitchen is well stocked and features stainless steel appliances and granite counter tops. Just off the kitchen is the laundry area with a sink and full size washer and dryer. 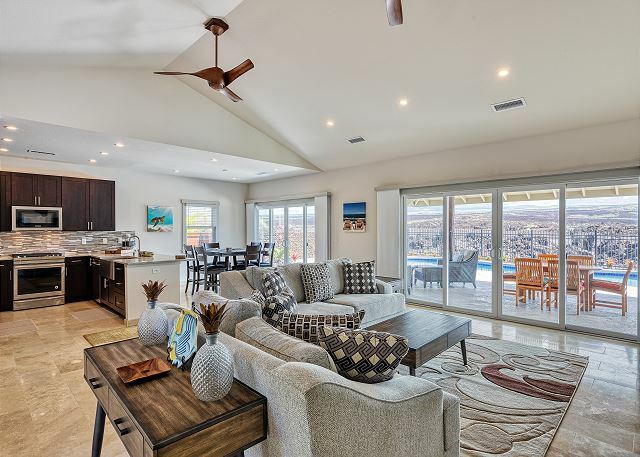 Both the dining and living areas open up to the lanai. Here you will find a dining area for 6 as well as a lounge area with a couch and two chairs. There is a nice size pool with a jacuzzi for your enjoyment. 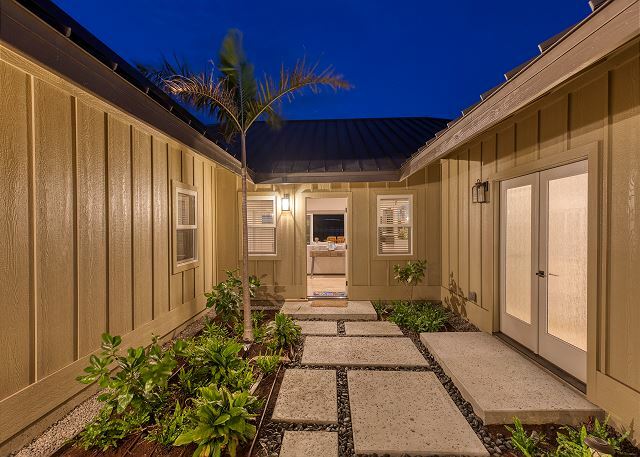 Just off the lanai is a large grass space for your enjoyment. Also you may enjoy cooking a local fish or steak on the propane grill. Just off the living area are two bedrooms. 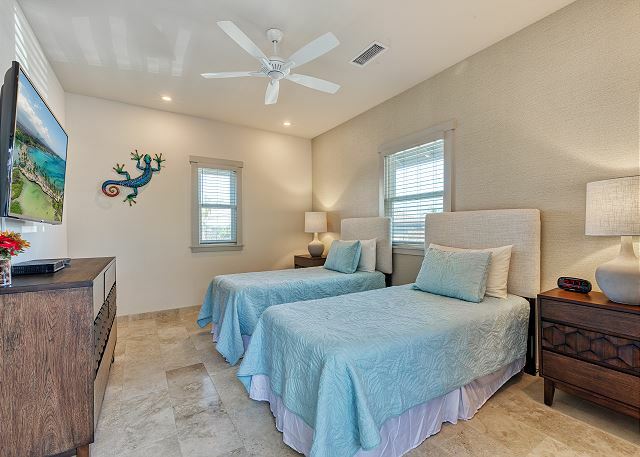 The master bedroom has a king size bed with bed side tables facing a wall mounted LCD television with extended cable. 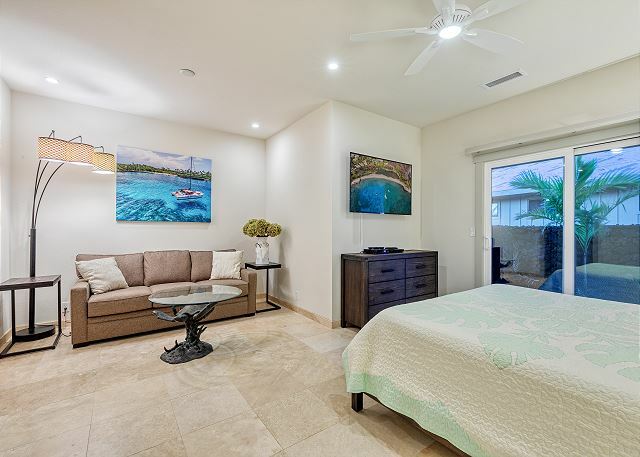 Large glass doors are just off the bedroom opening up to the lanai as well as offering a nice view. 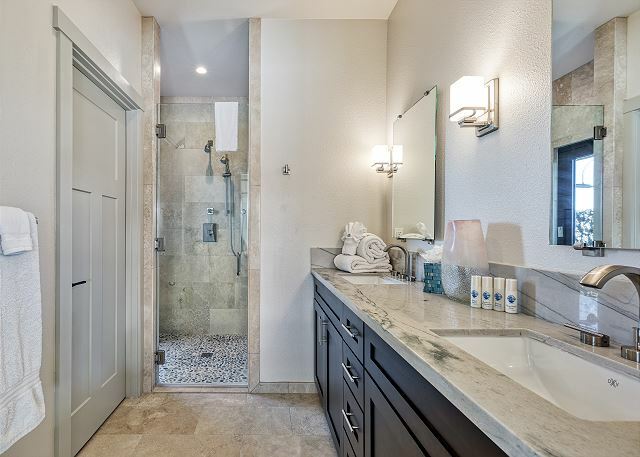 The master bath has dual vanities with a walk in shower. 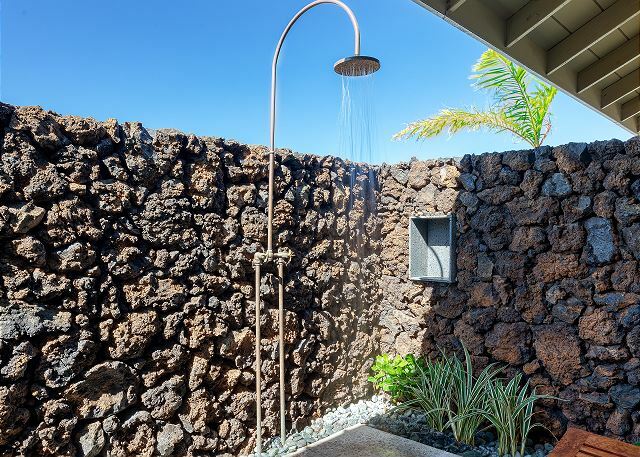 Just off the shower is a tropical space with an outdoor shower. The guest bedroom has two extra long twin beds that can be converted to a king upon request with two night stands. They face a nice dresser with a wall mounted television with a DVD player and extended cable. The entry to the home features a nice tropical garden and outside the entry you will find a separate detached bedroom. This room is very spacious and has a king size bed facing a wall mounted television with DVD player and extended cable. It has a nice space for lounging with a couch and end tables. There is a small refrigerator with a sink for your use also. There are large glass doors that look over palm trees. Outside these doors is a path to the pool area for easy access to and from the pool. There is also a full size washer and dryer set in this room. 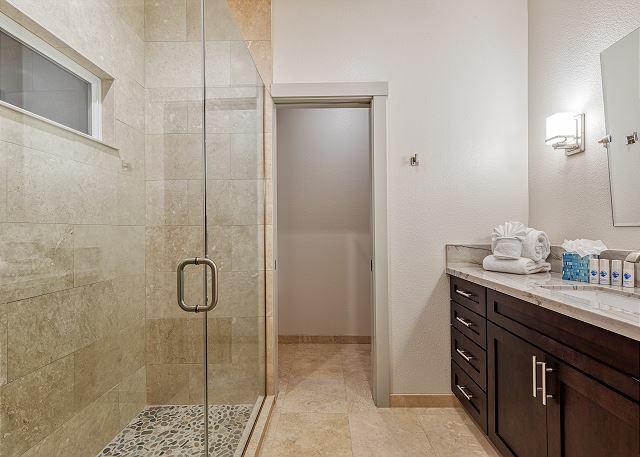 The attached bathroom has dual vanities with a walk in shower. This home also features air conditioning as well as wifi. 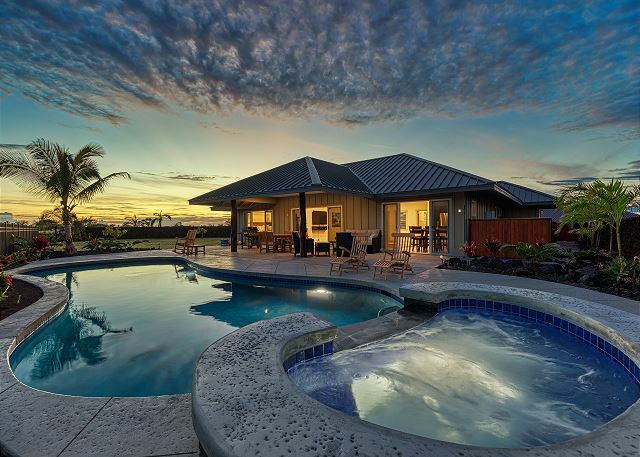 Ainamalu is the newest development at Waikoloa Beach Resort. 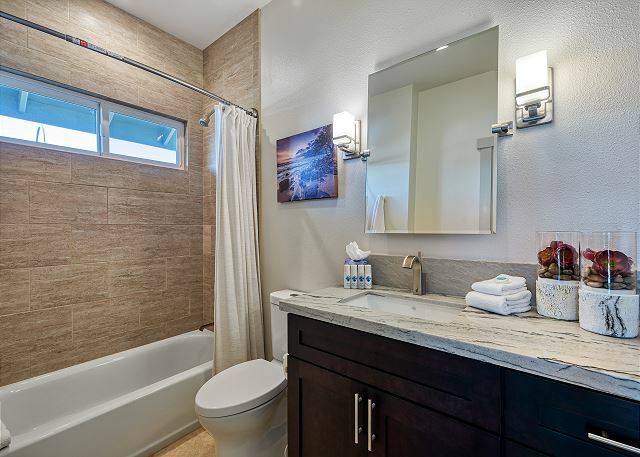 This community currently offers private homes and in the future is planned to offer a selection of condominiums. The homes at Ainamalu range in size from 3 bedrooms to 4 bedrooms and offer a variety of views. Some of the golf estates overlook the Waikoloa Beach Resort golf course. 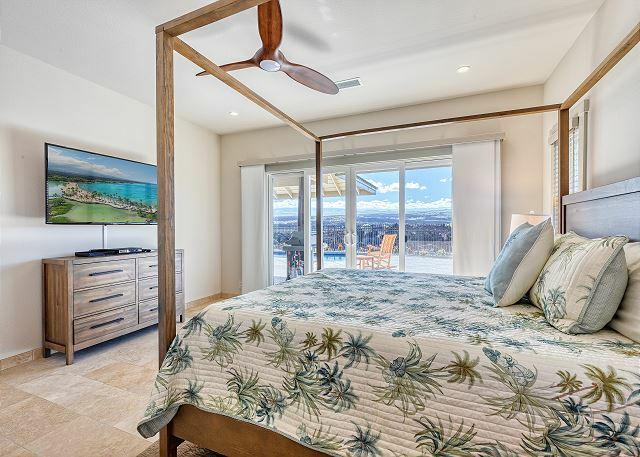 The other resort residences offer a variety of views from distant ocean views to views of the beautiful Mauna Kea mountain.